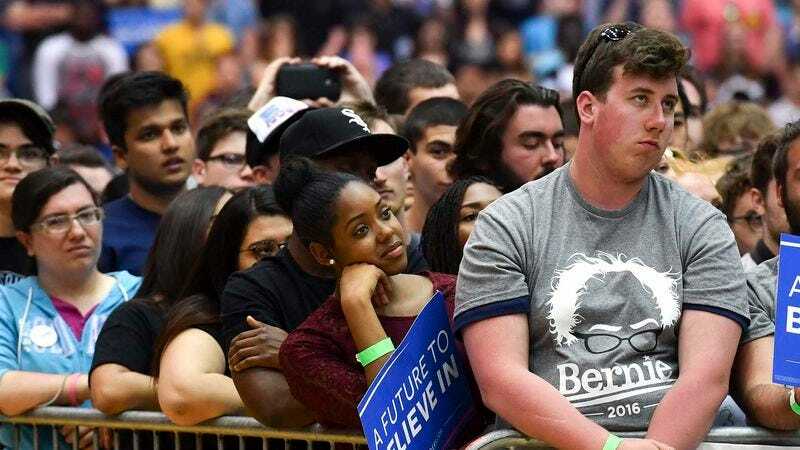 PHILADELPHIA—In response to the Vermont senator calling upon all Democrats to come together to assure the party’s victory in the presidential election this November, thousands of Bernie Sanders supporters were reportedly left deeply aggravated Monday after he didn’t use his Democratic National Convention speech to encourage voters to act against their own self-interest. “I just don’t understand why he didn’t go up there, be honest about everything that’s wrong with this election, and tell us all to take an action that would inflict deep and lasting harm on ourselves by reversing the policies and values we’ve been pushing so hard to expand,” said Kyle Jorgenson, echoing the sentiment of numerous angry supporters who hoped, especially after the recent leak of emails revealing the Democratic National Committee’s bias against Sanders, that the candidate would urge them to approach this year’s election in a way that would result in the immediate erosion of so much of what they believe in and hold dear. “He really should have taken a stand and declared that if the Democrats aren’t willing to nominate a true progressive, then we should all engage in behavior that ultimately serves to benefit a candidate diametrically opposed to those ideals. I can’t believe he would drop the ball on encouraging us to completely disregard the kind of world we’ll be forced to live in for the next four to eight years and instead act out in shortsighted petulance.” Irritated supporters then called upon those who still believed in progressivism to take the necessary measures to set back society for decades to come.